Ortelio is named after Abramo Ortelio (also known as Abraham Ortelius in English, referred with this name to avoid confusion herein), who was a cartographer and geographer, credited as the creator of the modern atlas. 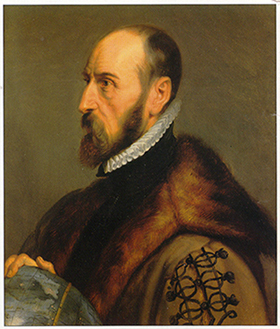 Ortelius was the first person who compiled existing local maps to make the first world atlas. Ortelius’ seminal work was the “Theatrum Orbis Terrarum” (Theatre of the World), which is considered to be the first true modern atlas. Written by Ortelius and originally printed on May 20, 1570, in Antwerp, it consisted of a collection of uniform map sheets bound together. In this way all existing cartographical knowledge and information about various areas and territories on earth was compiled in one single work. This amazing historical document was of course far from complete, and the Flemish scholar considered it a work in progress. Before these pages were printed no one had ever considered putting together all of the known maps of the world into one edition. Up until this time, maps were usually loose sheets of paper of varying sizes and dimensions. Because of the variety of sources it was almost impossible for sailors and scholars to accurately compare distances, plan voyages and advance their work. This is the Ortelius’ genius – by compiling all the best-known maps of his day he was able to create the world’s first atlas, and greatly assist the world explorers of his time. In the same manner, Ortelio is aspiring to utilise world top scientific knowledge and expertise in a collaborative environment of research and development. By gathering knowledge and expertise from diverse scientific disciplines, we assist our clients to plan and execute their own voyages in today’s complex environment.